Outloud Citymals is an app that can be used to support speech production, understanding emotion/causality and develop communication skills in children with complex communication needs. The app can used across a variety of settings; therapeutic, education and home. 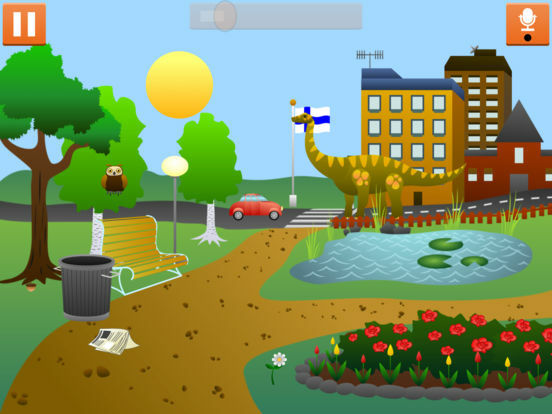 Outloud Citymals is a great app that can be used by Speech & Language Therapists and Teachers. The app can be used to improve vocalizations for children with speech difficulties. 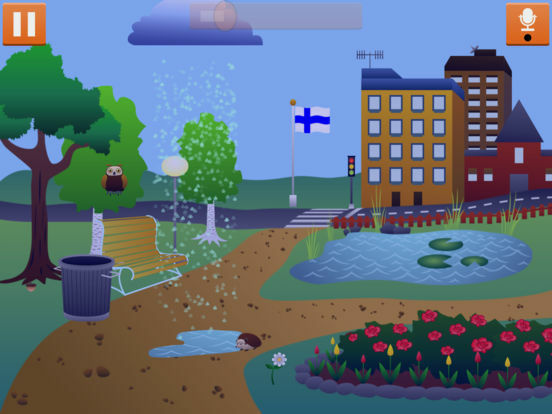 Citymals is a voice activated game which is an excellent feature considering its purpose with the aim of the game to change the scene using vocalizations. Upon opening the main the main scene you are welcomed to the town of ‘Outloud’ a park scene with an adjacent road, zebra crossing and buildings. You can either skip or follow the useful tutorial to show you what needs to be done to get started. At the top of the screen you will find a sound bar that is activated when you speak or make a sound. You arrive in the town of ‘Outloud’ early in the morning with the first sound you make activating an alarm, from then on each sound that activates the sound bar causes various animals to arrive on the scene an interact with the landscape in different ways. At the end of the day you are presented with a menu that reminds the user of the different animals or items that you have seen during the day. Whilst using the app with some children who are minimally verbal, I initially modeled activating the sound bar and it didn’t take long before they understood the purpose of the game. I really like the commentary feature where you can record the session, brilliant for monitoring progress over time and playing back to young learners. A voice activated causality game was something new to me and our young learners but what a great idea and excellent resource. I believe this to be a wonderful and user-friendly app that can be used in a variety of ways and with different developmental levels. I used the app with children at a very basic sound level moving onto trickier sounds and also with children working at word and sentence level. You can also use the app to support the learning of prepositions, which many of our children with complex communication needs find difficult. Exploring what is happening in each scene with the characters is also beneficial when working on emotions and cause and effect. We also used the app in group situations by casting the ipad to the Interactive Whiteboard, which the children enjoyed. I have also used the app whilst using aided language stimulation and modeling core vocabulary on the children’s mode of augmentative and alternative communication device/visual, which I found very beneficial. There are so many teaching points to work on in this app. In the settings section you can turn off the menu music, tutorial and adjust the sensitivity of the sound bar, a really useful feature. The developer’s website also contains an informative blog that can be accessed by practitioners and parents. They also have a good presence on major social network platforms. Overall I think Outloud Citymals is an excellent application, easy to use and can be used in educational, therapeutic and of course home settings. If I could make minor suggestions, it would be the ability to send recorded sessions to parents and a simple reward system that motivates the user. These are minor considerations that certainly do not detract from a wonderful application. A big well done to the developers! Have fun with interactive, sound activated childrens' game. Citymals encourages little kids to produce sounds: Make a noise, watch how different animals appear in the scene, and complete level after level to collect them all! You can record voice and store the recordings, for example, to track progress or to listen to them with the speech therapist.